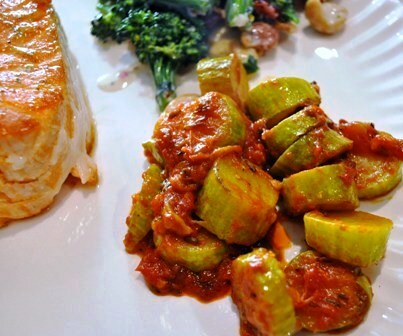 This is a very simple dish what brings out the flavors of the Tromboncino Squash. Excellent with Karen’s Grilled Cedar Plank Wild Salmon and Broccoli Salad with Cashews. Tromboncino is also known as zucchetto squash and can be found at local farmer’s markets and specialty stores. It is considered a summer squash variety but can grow into the winter season and still cooks up fine. Tromboncino Squash with tomatoes recipe, comments, and photos were shared with me by Karen Calanchini, Food Stylist and Photographer, of Redding, CA. Learn about Squash Hints, Tips, and Information, and more delicious Squash Recipes. Put on a pair of latex gloves before beginning this recipe. Always wear gloves when working with hot chile peppers (fresh, dried or roasted chiles). Never touch your eyes when working with chiles. Please don't learn this lesson the hard way! Roll the Arbol chile pepper between your fingers to loosen the seeds, then break the chile in half and shake out as many seeds as will come out easily; set aside. In a large frying or sautpan over medium heat, heat the butter and olive oil. Place the squash slices in the pan and simmer until the bottoms of the squash begin to brown. Turn squash slices over and let the other side brown. Add salt and pepper to taste. Add the Arbol chile pepper and the tomato. Turn heat to low and let simmer for approximately 15 minutes, stirring occasionally. The slightly softened tomato will break down into a nice sauce and will thicken as it simmers. As soon as the squash is cooked to your liking, remove from heat. Taste again for salt and pepper (adjust if needed), and serve. Variation: Feel free to add any fresh herbs, such as thyme, basil, or oregano. Replace the butter with olive oil to make a vegan version. * Trombocino Squash is also known as Zucchetta Rampicante Squash. It is a very tasty summer squash. You may substitute other squash such as Yellow Crookneck or Zucchini Squash. Look for it at your local Farmer's Market or local fruit and vegetable stands. It is fun to explore and cook with heirloom varieties of squash. **Chiles de arbol or arbol chile (ARE-bowl) are narrow, curved chiles that start out green and mature to a 3-inch to 5-inch bright red pod. The arbol chile is very hot, and related to cayenne pepper. These chiles register around 50,000-65,000 on the scoville heat unit scale (or about 7-8 on a 1-10 scale). These chile peppers are found Mexican Food Stores and in most hispanic food sections of grocery stores. If you can't find arbol or guamillo chile peppers, substitute dried cayenne chile peppers.